AT LAST … FREEBIE ALERT! 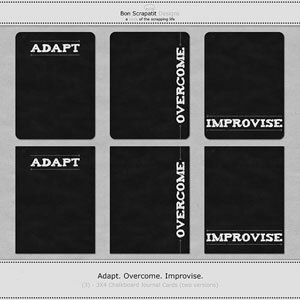 I’m back with another freebie, which just happens to be another coordinating page to our November *Days Gone By* challenge posting bonus, *Glitterfall*! I think I mentioned that Mark and Jessica’s wedding was not of the traditional variety and I LOVED every moment of it! They were married in the backyard of one of Jessica’s aunt and uncle’s homes that sits atop a hill (or small mountain!) with no other home for miles and a GORGEOUS 360-degree view! They even say that on a REALLY clear day, you can spy Half Dome in Yosemite National Park!!! All I can say is that it is breathtaking and I would have NO problem waking up to Dan and Kelly’s view every morning! The two lovebirds were joined in holy matrimony by a dear and long-time family friend who rode in on his Harley! So, needless to say, that Harley became an instant prop for LOTS of photos and you’d have thought that my other three sons and the best man ALL looked like the Secret Service!!! With it being SOOOOOO hot and the wedding party facing the sun, the guys ALL wore their sunglasses along with black slacks, white shirts and black ties! LOL! Can we say, “Men in Black”? Uh, huh! I will share a few more photos next blog post! REMINDER: If you would like to receive the kit, *Glitterfall* (featured below) for FREE, all you need to do is check out our November *Days Gone By* challenge in the Scrapland Express Forum (must register first in both the forum and the gallery), create a layout and then post in the Scrapland Express Gallery. You will receive links for the posting bonus via our private messaging system at Scrapland Express! Links are also posted on both mine and Dawn’s blogs (sidebars) at all times and will change to the new monthly challenge once it has been posted in the Scrapland Express Forum! We hope that you will come and join us and add to your family albums each month as we ALL scrap from *Days Gone By*! *big smile* To those who have already posted layouts, “thank you”! I’ve left y’all some love and I will be headed over later tonight or first thing in the morning to PM you your posting bonus!!! WOO HOO! Dawn (Snowsmoon’s Design), also has a FREEBIE for y’all this week on her blog this week (stay-tuned for another one towards the end of the week!). Click the preview image below to be transported to Dawn’s blog for your downloading pleasure and please leave her some love for sharing her BEAUTIFUL quick page using *Glitterfall*! Thank you girlfriend – you ROCK! Scrapland is bustling right now with the holidays just right around the corner! Stay-tuned as Dawn and I both will be participating in a few Christmas blog trains and will be posting more about them towards the end of month! Blog trains will be departing December 1st, so mark your calendars and prep your hard drives for some AMAZING and FESTIVE goodies from multi-talented designers from all over Scrapland! Thanks SO much for stopping in to visit and I wish y’all a GORGEOUS day and may it be FULL of scrap happenings! I hope you enjoy your goody. I have included two, one with the vellum journaling matte (custom shadowing included) and one without! A CHALLENGE AND A FREEBIE FOR Y’ALL!!! WOO HOO! Gosh, I have SO missed everyone and wish to take this opportunity to thank EACH and EVERY one of you for such a WARM welcome back, although, I’ve sure have been SLOW at getting back here, eh? LOL! Y’all are TOO sweet for words and I just wish you to know HOW special you are to me! Thank you from the depths of my being! Okay, I will catch you all up on things a little along the way as it has felt SO good to get back to Photoshoppin’ and I wish to start working on some NEW designs! I am going to do things a little bit differently this time around as my perpetual late nights have wreaked havoc upon me and I am now on a schedule and in bed by 11:00 pm PST, most of the time! Yeah, that has been a bit difficult when being a night owl is in your DNA, however, for health purposes and giving my body the ability to rejuvenate, I quickly threw up the white flag and gave in! He, he … not to mention that I am now up and at ‘em early and walking with the LOVE of my life! More about that another time! I am sharing just a few photos from my son’s wedding the end of September! We had a FABULOUS time! I will give more details in another post along with sharing a few more photos. My method to my email madness was to finally cave and put everything here on my design computer AND to make them all Internet based! For me, this will work well as I will no longer overload my computer with saved email and will have access to everything in ONE location. I chose to go with G-mail for this since I already had two accounts that I had been longing to merge into one! I am happy now that I can view ALL mails in the same window and when I get a little more time, I may even apply a few filters to simplify things even more! To those of you who have inquired about past kits, I shall reply to you directly. If you have inquired and do not hear back from me within the week, please send again as I either have not received it or have lost it in the process of moving mail. Carolyn – I am remembering a comment from you that you had sent me an email about Armour Thyroid. I searched and searched and did not locate one. Would you please resend as I am VERY interested in reading what you have to share. Thank you! I hope that y’all will join Dawn of Snowsmoon’s Designs and I for this month’s *Days Gone By* challenge! Seeing as how we are coming up upon Thanksgiving here in the United States, we are challenging you to create a layout that preserves something or someone that you are thankful for from *Days Gone By*! You can find all of the details HERE! (you MUST be registered first) You will also see all of the links posted on the upper-lefthand side of my blog throughout the month. Dawn will post info and links on her blog as well. Please give us feedback if you encounter any troubles in registering and/or getting into the forum. You can reach me at bonscrapatitdesigns (at) gmail (dot) com. I gave out a small sampler of this mini-kit last year, so some of you may remember it! This was my contribution to the monthly Treasure Chest at One Single Seed, formerly know as Treasures To Scrap, which closed during the summer, so I am now free to sell it or give it away! Guess which I am doing??? HA, HA! When I first saw the color palette, I was stumped! Once my mojo kicked in, I didn’t wish to stop! I LOVE this combination of colors – SO rustic and perfect for this time of the year, don’t you think? And for your freebie today, I am giving y’all the scrapatit I used to scrap some of Mark and Jessica’s wedding photos which, of course, is made from our November challenge posting bonus, *Glitterfall*! ENJOY and I’ll see you again SOON! Have a GORGEOUS day everyone! PHEW! I am FINALLY getting back into my designing groove! YAY! I was getting a bit concerned about myself, but just needed a little extra time to collect my thoughts and hunker down for some SERIOUS business! Hope everyone has had a REFRESHING weekend and that y'all are ALL rested up and ready for the NEW week ahead! I said I would continue from last post and add some more photos, so what better way to present them than in your GOODY for today! 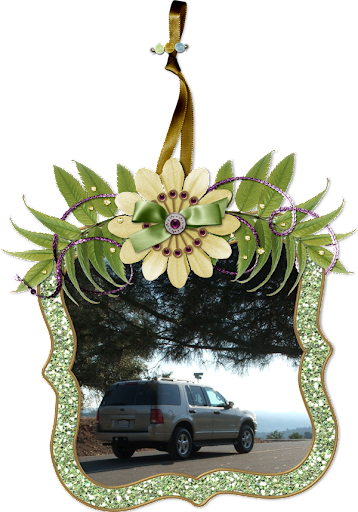 It is an "Embellished Glitter Bracket Frame", using the frame that MOST of you downloaded from F.o.r.e.v.e.r. Freebies at the beginning of the month! For those who might have missed the FULL kit, *Oopsie Daisies*, it is still available HERE. A real quick EXTRA "thank you" to y'all for making my kit such a success over on Brandy's site - WOW! Y'all are just WAY to nice you know! *big grin* MWAH! 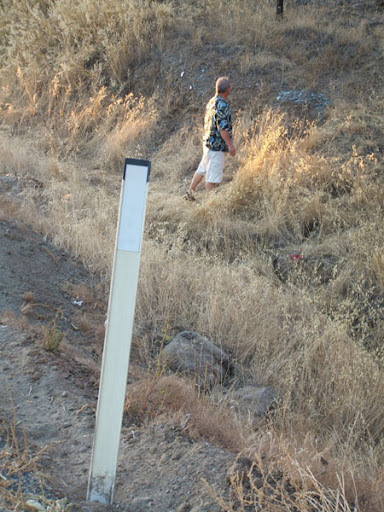 Okay, I am posting a few photos of the area where John fell asleep and went off the road. 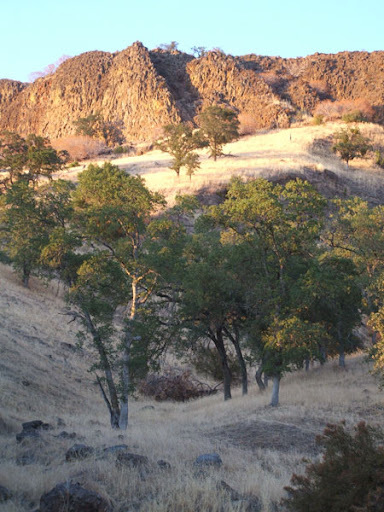 I will caption beneath each photo and this will also give you a bit of a feel for where we reside here in the foothills of Northern California! You will also see WHY we are referred to to as the "Golden State" in MORE ways than one! 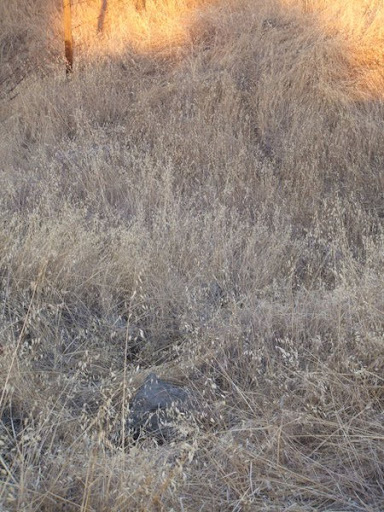 Yes, the discovery of gold AND the golden hills during the heat of the summer when the LUSH greens of spring give way to dry, wheat-like hillsides. 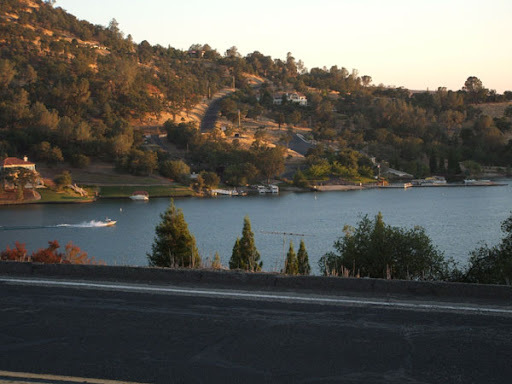 And you just KNOW that makes our BEAUTIFUL Lake Tulloch all that much MORE appealing this time of the year! of highway. The photo below is of the lake just across from where the accident occurred. Again, I am SO thankful, and so is he, that he veered off to the right rather than the left. making this decision on his own, without being asked. which is made of flexible material thank goodness! waterfalls that form once the rains begin. and keeping the vehicle from traveling any further! SO, SO thankful! Robert having just pulled out of our gate and on his way to work in his "new"
side! LOL! I was spot-on! even MORE incredible miracle of John's survival. and it re-enforces to me that John's time and purpose on this earth is NOT finished! CAN WE SAY *OOPSIE DAISIES* ONE MORE TIME? A REAL BIG BOO-BOO AND A FREEBIE! Thank you EVER so kindly for your steadfast patience and sweet messages since my last post. You warm my heart and I am SO thankful for you! The past TWO weeks have been BUSY, BUSY, BUSY! Did I say BUSY??? ROFL! I've had no computer time, but LOTS of PRECIOUS family time, which has been LONG overdue for THIS girl! 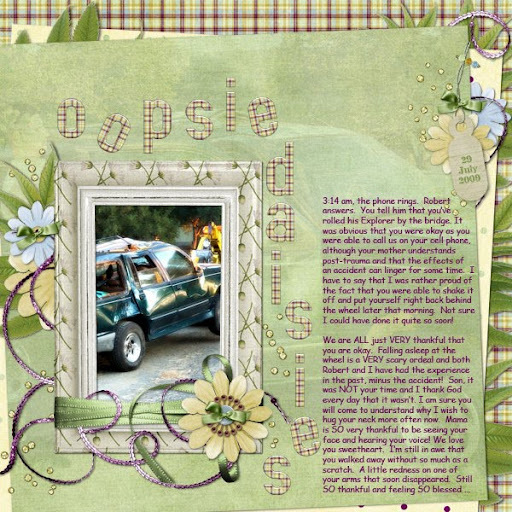 Of course, I will have OODLES to share this week and then I need to hanker down and get 'er done for my upcoming Grand Opening at Digi Scrap Obsession! WOOT! Okay, down to business. SO, what do my kit, *OOPSIE DAISIES* and a REAL "big" boo-boo have in common ... OH, and the "miracle" I was eluding to two weeks ago??? The following photos will tell the majority of the story, however, I shall give you a bit of an intro, HA! Wednesday, July 29, 2009 at 3:14 am, Robert answered the phone to hear my son, John, on the other end explaining to him that he'd just rolled Robert's Explorer on his way home from work. All I remember is hearing Robert ask, "Is it in the water John?" Y'all just KNOW that my heart sank. In the past couple of years, two semi-trucks have missed the turn just before the bridge and have gone through the railing and plummeted into the deepest part of the lake below. *sigh* John told Robert that he had gotten beyond the bridge, past the resort and just shy of Poker Flat, which is where the boys and I lived when Robert and I first met. Just beyond the resort is a semi-steep hill and a curve. It was just after reaching the top of that hill that John fell asleep. All he remembers is awakening and finding his body unable to react to the direction the Explorer was taking and he told me that he just "went with it"! I am sure many of you know that feeling when your body is unable to respond to what you are thinking it SHOULD do when you are tired! Bless his heart. In retrospect, his "going with it" and the fact that his body was totally relaxed from being asleep, plus his wearing his seat belt kept him from sustaining serious injuries or worse. Not to mention that it simply was NOT his time! Oh, and on the opposite side of the accident scene is a cliff with the lake below. John did mention to me in a one-on-one conversation that he DID believe for a moment that he was going to die. Knowing that alone, as a mother especially, pulls BIG time at your heart strings as you try to EVEN imagine what your child was feeling at that VERY moment of helplessness. I, personally, have NEVER been in that position. I have feared for my life at the hands of another, however, I have NEVER been in the face of death. John works at the same place as Robert. While saving his money for a car of his own, Robert has generously been allowing John to drive his pride 'n joy to work. Robert works days, comes home and off goes John, who works swing. John had fallen asleep and veered off of the highway ten minutes or less from home. Our two-lane highways are dark and desolate in the wee hours of the morning. 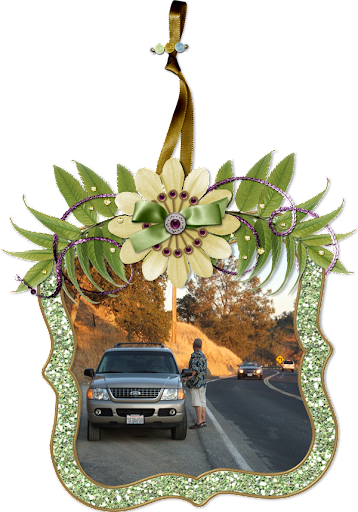 We have to cross a bridge over our BEAUTIFUL Lake Tulloch before reaching the final stretch of highway home and that is where Robert had thought John rolled the Explorer. 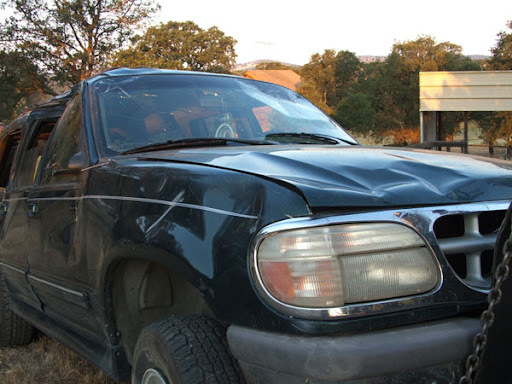 Mind you, you just KNOW that John was already traumatized, let alone having to call and tell Robert that he's totaled his (Robert's) ONLY source of transportation to work! I can breathe a little now as I type, but at the moment, I was holding my breath as Luke came to pick Robert up and then drove to scene to see just how much damage was done. I was IMMEDIATELY relieved and EVER thankful that my son was alive and had literally walked away from the vehicle without a scratch. 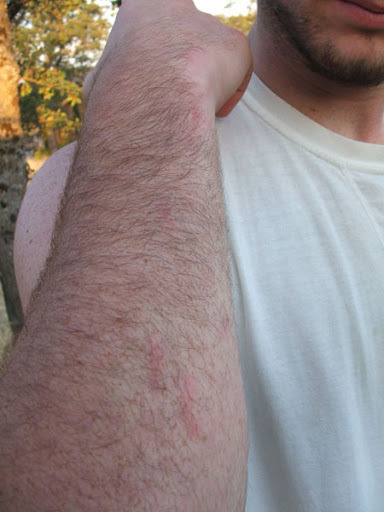 Well, I do have a photo of some red marks on his forearm, but those quickly disappeared. relaxed and they don't normally tense up. Neither did John. VERY dry season and, thankfully, the muffler did not start a fire. PHEW! This is where I left off the Friday evening when I was called away from the computer to deal with a family matter. We then left for the weekend to attend the "80's" bash, returned yesterday to rest up a bit before Robert had to leave to go to work for a couple of hours. I received a call from him asking if I'd heard that John had totaled his twin brother, Luke's car. WHAT? Still in the midst of full-body pain from the fibro flare-up, I gently told Robert that I could NOT hear this now. 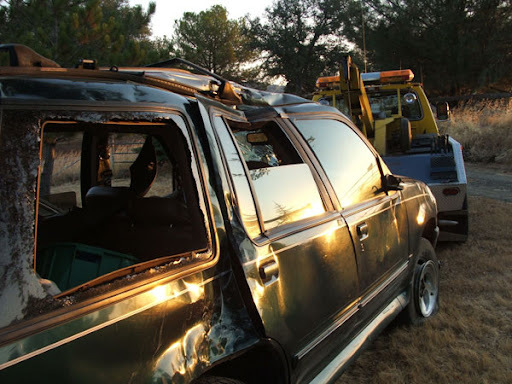 How could my son have yet ANOTHER serious accident within the span of two weeks and walk away from it? It was NOT his time!!! Thank you Daddy! I will tell y'all straight up that having homeschooled my six children for six years gave me the BEST education of a lifetime, IMHO! I learned SOOOOO much about learning styles, teaching styles, personality types, etc. Because of this and the therapy my boys and I went through to deal with PTSD (post-traumatic stress disorder) shortly after my divorce, I have learned OODLES and can actually sit down and talk to my son, knowing what will cause him to shut me out, and get down to what's going on. I am not saying that I am successful EVERY time as sometimes my own emotions get the best of me, but I am learning MORE and MORE each time I am faced with something serious that needs resolution. John was diagnosed ADHD and I came to the conclusion that after he was released from his IEP in high school, when they told us he no longer needed their services because his test scores were too high, that his trouble is, for the most part, emotionally based. The panel of teachers and administrators were in agreement with that as well. Enter in PTSD. I have come to find that the more people harp on him, telling him what he NEEDS to do and WHEN, he gets overwhelmed and even when trying to focus on clearing his mind, the thoughts all creep in and he stresses - SILENTLY and consumed with what others are expecting of him. He told me that he KNOWS what he needs to do, but needs to slow down and he can only do so much at a time. I am trying with all of my might at this point to be the go-between and to help shield him from a bit of unnecessary flack after the fact that he has LITERALLY been in the face of death twice. How can anyone TRULY understand what goes on in the soul of another human being if they've not even come close to such an experience? You cannot. As I am HORRIBLY behind and really wish to spend this week preparing a few kits for my NEW store at DSO (I REALLY need to make a little money now that we've had to take on a car payment with the loss of the totaled Explorer and the fact that Robert will have to double his mileage in taking John to work as soon as he gets home from his day at work and then get up at 2:30 am so that we can pick him up at 3:00 am), I shall continue this another post and share with you the thoughts that went through my son's mind as he thought he was going to die in each accident - MORE so the second time around. (I have not seen the car and John did not wish for me to. As he explained, "it's toast, it's done" I am hoping for some photos from Luke though, since it is his car. He is VERY upset right now after driving up to see it earlier this evening.) I am now hoping and praying that there NOT be a another incident. While I GREATLY believe in an appointed time for death ... I am NOT privy to that date, so I can ONLY hope and pray that I NOT have to see it come to pass in my lifetime. I have SO learned to live in the moment, for I know not when my last breath may come, nor that of a loved one. I have found that in the course of a phone conversation with one of my children, I will say "I love you" multiple times. And again, the song drifts through my mind, "there is NO time for fussing and fighting my friends ..."
So here you have it - the good, the bad AND the ugly! LOL! I needed to laugh right about now! 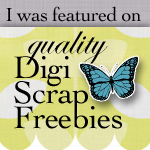 Please find below a "scrapatit" from my layout "Oopsie Daisies" and I hope to have some more goodies for you soon as well as photos from my daughter and SIL's visit weekend before last and from the BIG "80's" bash this past weekend. Gosh I've missed y'all! To those who have sent me e-mails over the course of the past 2-1/2 weeks, I shall try my hardest to reply to them sometime this week. My heartfelt THANK YOU to those who have left me LOVE during my MIA status. You sincerely ROCK! MWAH!